Seven years is a long time in gaming. Entire consoles rise and fall, companies and individuals alike can go from rags to riches — but most significantly, games themselves undergo a continual transformation moulded by the experience of their creators and the expectations of their audience. In Mario Kart‘s case an entire genre had been born around its core gameplay. Kart racers had become as ubiquitous as 3D platformers or 2D fighters before them, and while most had been slapdash efforts based around licenced property, some titles had refined or innovated the genre while Nintendo had been slumbering. For Mario Kart to retain its best-of-breed status, it needed a headline feature – something to help it stand above and beyond its many imitators. The rarely seen LAN title screen. Equally important, from Nintendo’s perspective, was that the series capitalise on its historically broad appeal. The team was tasked with creating a new entry that could be enjoyed by veteran players without alienating those who were new to the series or to gaming in general. Simplicity was the watchword; features like Game Boy Advance connectivity were mooted and then dropped as the team sought for that elusive, iconic innovation that would attract new and old fans alike. The result was Mario Kart: Double Dash! !, the two exclamation marks the first indication of how unashamedly brassy and cacophonous this entry would be (and discarded for the rest of this piece). 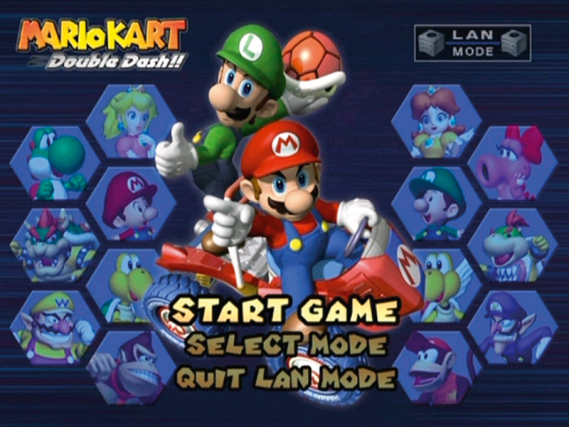 Each kart in Double Dash would hold two racers, mixed and matched from the roster at the player’s whim – an arresting visual hook from which the rest of the game’s unique mechanics fell naturally. Karts now had unique properties of their own, with the choice of characters determining which class of karts were available to each player. Bowser was never going to squeeze into Baby Mario’s buggy, but it didn’t mean he was bereft of the choices offered to smaller players. More significantly, each player now had a signature “special weapon” that might appear from the item roulette. High powered and chaotic, smart pairings of characters could ensure that these weapons had devastating consequences when unleashed in pairs. 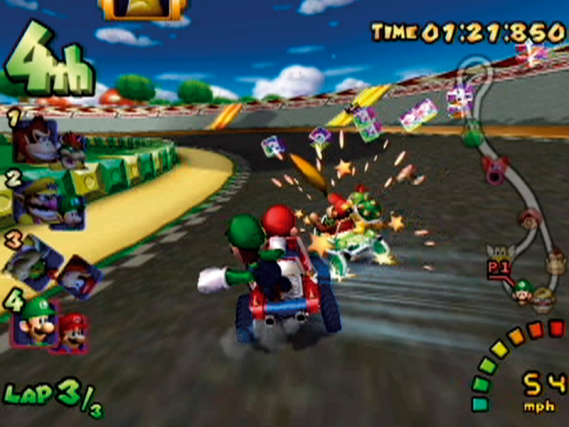 Luigi Raceway’s two straights are immediately adjacent, allowing for weapons crossfire. The ultimate exploration of the pairing mechanic allowed two human players to share a single kart, switching between the “pilot” and “gunner” positions respectively. While this mode offered some intriguingly social opportunities, including the ability to steal other drivers’ held items with a precision side-swipe and the titular “Double Dash” boost, karting by consensus was much slower and wasn’t quite enough to occupy each player’s attention during the event. Ultimately, the most fun was still to be had in races where everyone had a kart of their own, particularly if you could avail yourself of the eight-player LAN feature (a mode that required Super Circuit levels of peripherals and forethought to set up). With each kart now in need of a passenger, the character roster was expanded for the first time since the series’ debut over a decade before. Even more characters could be accessed thanks to the game’s many unlockables – a first for the franchise and an incentive for seasoned players to take part in the easier cups – bringing the total up to 20. Petey Piranha and King Boo were wildcards who might receive any of the other characters’ special weapons, while Toad and Toadette fleshed out the understaffed lightweight class. Solo players had another reason to celebrate; the AI rubberbanding had been greatly reduced compared to other entries in the series, and a doubled weapon inventory made it easier to reclaim first place in the event of a particularly harsh blue shell. Weapons were to be the great leveler of Double Dash; the key to its accessibility and the bane of those players who placed greater emphasis on racing lines than marksmanship. The game’s tempo led to earning and discarding items almost immediately and the secondary mechanics all fed into that – players could no longer drag items, shells no longer orbited their owner and taking a hit (which would happen on a regular basis) meant your held items would go tumbling onto the tarmac ready to be picked up by another player. Even boosting into an opponent would be enough to empty their pockets. When giant Bowser shells, rampaging Chain Chomps and item-nabbing shields were unleashed as special weapons the result was rough and tumble; a free-for-all where first place was often decided on the final bend and no-one lagged behind for long. 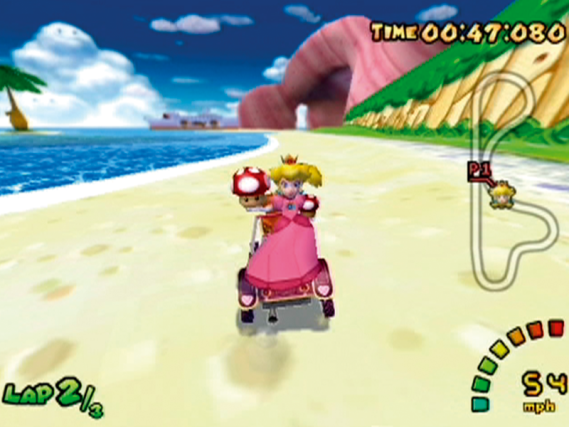 Players can use mushrooms to boost through the flooded sections of Peach Beach, avoiding murderous Caterquacks. The track design further encouraged this riotous behaviour; most of Double Dash‘s courses were heavily interwoven, briefly splitting players apart before bringing them back together (occasionally in a head-on showdown). There were no coins to collect, but the prized double item boxes were used as rewards for discovering alternate routes or consolation prizes for being sent the long way around. Bona fide shortcuts abounded, but more frequently relied on the ever-present items to navigate successfully. The tracks themselves, while less experimental than Mario Kart 64‘s first foray into 3D, were a varied assortment ranging from the downhill off-roading of DK’s Jungle Mountain to Waluigi Stadium, a treacherous metal walkway as warped as Rainbow Road itself. The shift away from racing finesse was never more apparent than at Baby Park, a diminutive oval that could easily have been mistaken for a battle mode arena. Nintendo had succeeded in levelling the playing field, but while some delighted in the rambunctious, no-consequence appeal of Double Dash‘s multiplayer, there were those – gamers and critics alike – who lamented that skill and mastery counted for so little this time around. Edge Magazine‘s infamously scathing review declared the title to be a “party game” instead of a racer – an opinion that could only have been compounded by the simplicity of the single-player experience compared to the attention lavished on the co-operative and battle modes. Ten years later and with no weight of expectation, attitudes towards Double Dash have softened, but the irony remains: Nintendo’s studious attempt to make a Mario Kart that appealed to everyone ultimately resulted in one of its most divisive creations to date. This entry was posted in Gaming and tagged Double Dash, Mario Kart, Nintendo. Bookmark the permalink.